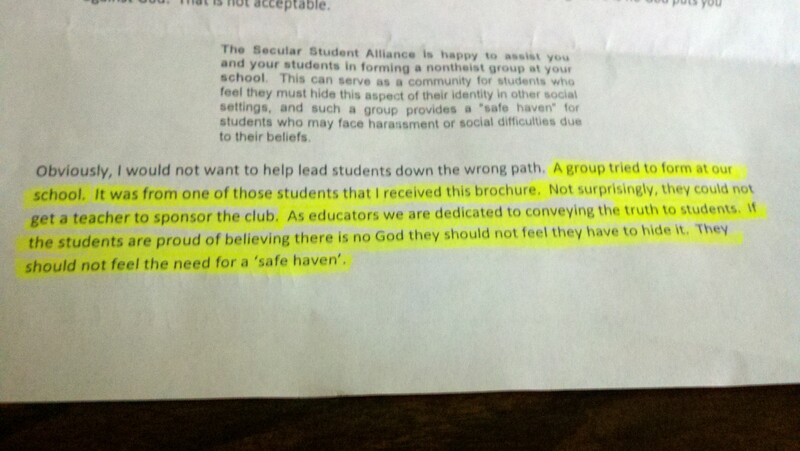 An anonymous teacher sent JT Eberhard, high school specialist at the Secular Student Alliance (SSA), an advocacy group for non-religious students, a letter bragging about being able to prevent a student atheist group from forming at his school. In response, Eberhard investigated and eventually uncovered the identity of the teacher and then wrote a letter to his principal explaining why he believed the educator's actions were inappropriate and even illegal. In the letter -- which was also posted to his blog -- Eberhard notes that students took the initiative to form the group after receiving a brochure from the SSA detailing ways they could become involved with the organization. "Educational staff has the responsibility of preparing students to be responsible adults. We expect all students to be treated with respect. We are not, however, obligated to protect those who choose to be deviants in society. Obviously, I would not want to help students down the wrong path. A group tried to form at our school. It was from one of those students that I received this brochure. Not surprisingly, they could not get a teacher to sponsor the club. As educators we are dedicated to conveying the truth to students. If the students are proud of believing there is no God they should not feel like they have to hide it. They should not feel the need for a safe haven." In his letter to the principal, Eberhard said the teacher's statements were illegal because they violated the Equal Access Act -- a federal law requiring federally-funded schools to provide equal access to all student clubs. Eberhard went on to say that he may take legal action against the school if the administration does not "rectify this situation." "I will give you until Monday morning a 9am EDT to consult your legal counsel and to respond to this email with how you plan to rectify this situation. Your legal counsel will undoubtedly ask you if the students who attempted to start the club will still be students at XYZ in the fall. I have taken the liberty of answering that question before contacting you: yes, they will be. You will also need to let me know a time on Tuesday that the SSA’s Regional Organizer in [US STATE], [SSA ORGANIZER], can come to your office and talk to you about Mr. XXXXX’s letter." According to Eberhard, incidents like this are not uncommon. "This is not the first time we've gotten word of a teacher/administrator like this. Not even close. The reality is that more than half of high school secular groups that attempt to form experience some kind of resistance from their faculty or administration," Eberhard told The Huffington Post in an email. "But people are becoming more aware. Watching that support roll in even more than before during the last few days has meant the world to us at the SSA -- and even more to the high schoolers." Eberhard also told HuffPost he is refraining from releasing the teacher and school's information for now because the teacher and HR department contacted him asking to extend his deadline to Wednesday.